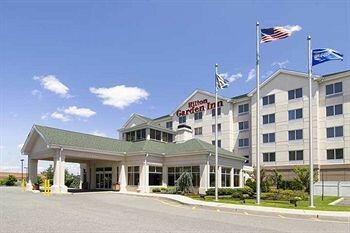 Property Location A stay at Hilton Garden Inn Nanuet places you in the heart of Nanuet, convenient to St. Paul&apos;s Episcopal Church. This hotel is within the vicinity of New York Country Club and Palisades Center.Rooms Make yourself at home in one of the 88 air-conditioned rooms featuring refrigerators and flat-screen televisions. Wired and wireless Internet access is complimentary, while MP3 docking stations and cable programming provide entertainment. Bathrooms have designer toiletries and hair dryers. Conveniences include phones, as well as desks and complimentary weekday newspapers.Rec, Spa, Premium Amenities Don’t miss out on the many recreational opportunities, including an indoor pool, a spa tub, and a fitness center. This hotel also features complimentary wireless Internet access, shopping on site, and discounted use of a nearby fitness facility.Dining Grab a bite to eat at the hotel&apos;s restaurant, which features a bar, or stay in and take advantage of room service (during limited hours). Quench your thirst with your favorite drink at a bar/lounge. Full breakfasts are available daily for a fee.Business, Other Amenities Featured amenities include a 24-hour business center, express check-out, and dry cleaning/laundry services. Planning an event in Nanuet? This hotel has 2500 square feet (232 square meters) of space consisting of conference space and meeting rooms.